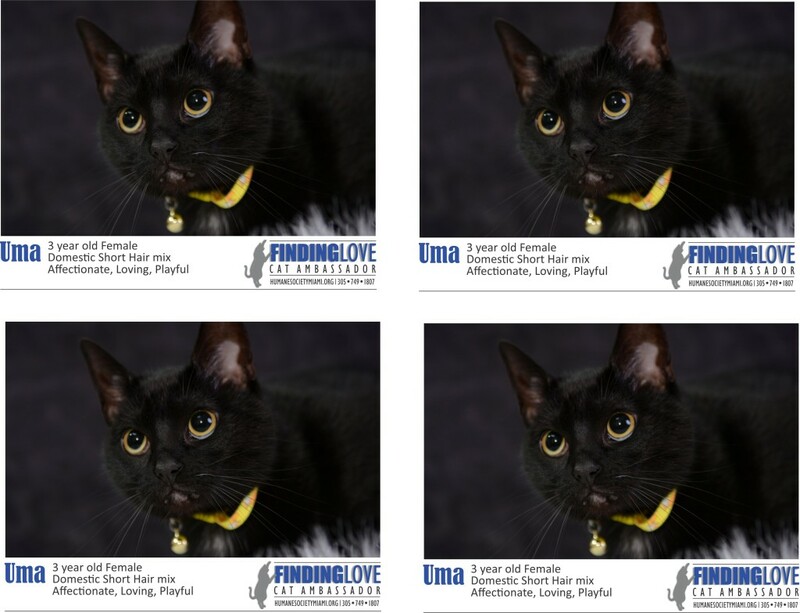 Meet some of our wonderful cats who have been waiting to find their forever family for a long time. Some of them have been with us for more than 1,200 days… and that is a very, very long time. 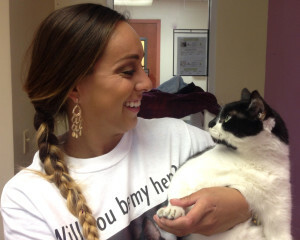 Although they get lots of love from our staff and volunteers, a shelter is not a home. We are calling for your help! 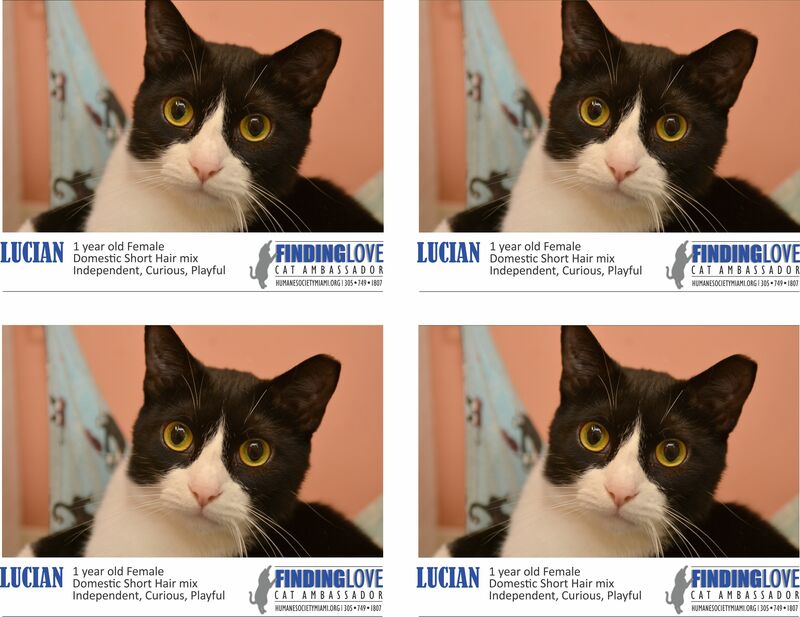 Help us promote these beautiful and special cats and hopefully, together, we are going to find their long awaited home! Choose below a cat you want to help find love! 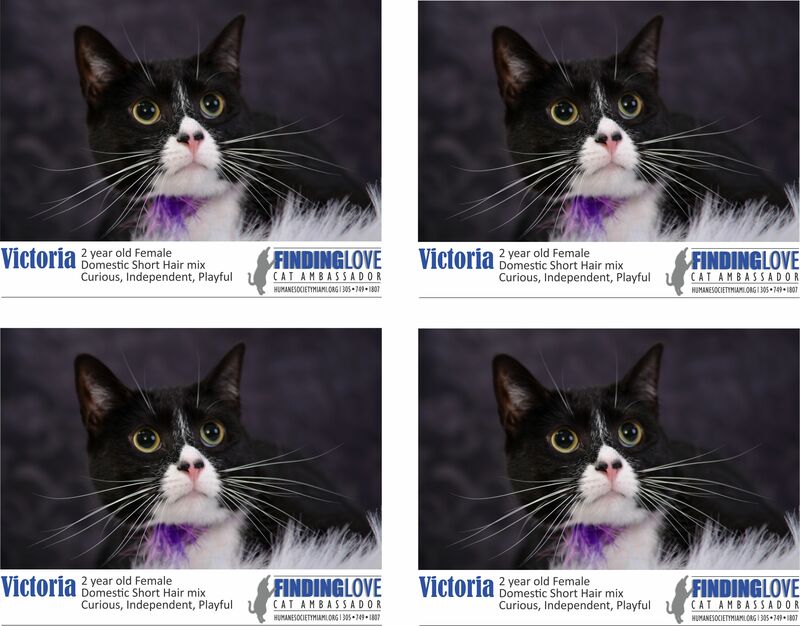 Download her/his flyers (by clicking on the provided pdf links) and post them in your workplace, neighborhood, favorite stores and businesses as well as on your social media and website. Flyers for distribution are also available for pickup in our shelter. 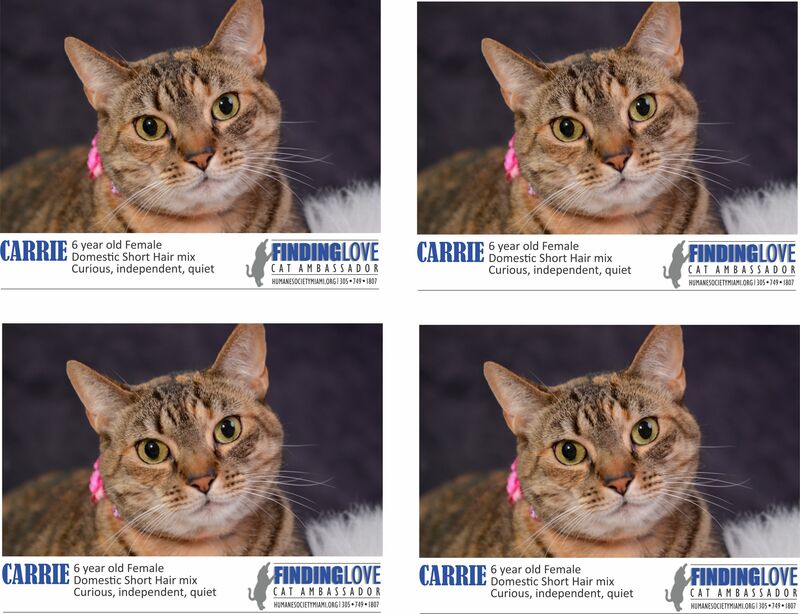 Get a t-shirt featuring the cat you want to help find love and wear it to create awareness. Take a photo in your t-shirt and share it on social media. Remember to tag us (facebook: @HumaneSocietyofGreaterMiami and Twitter: @humanemiami) and we’ll be happy to support your efforts! The cost of the cat ambassadors t-shirt is $10. 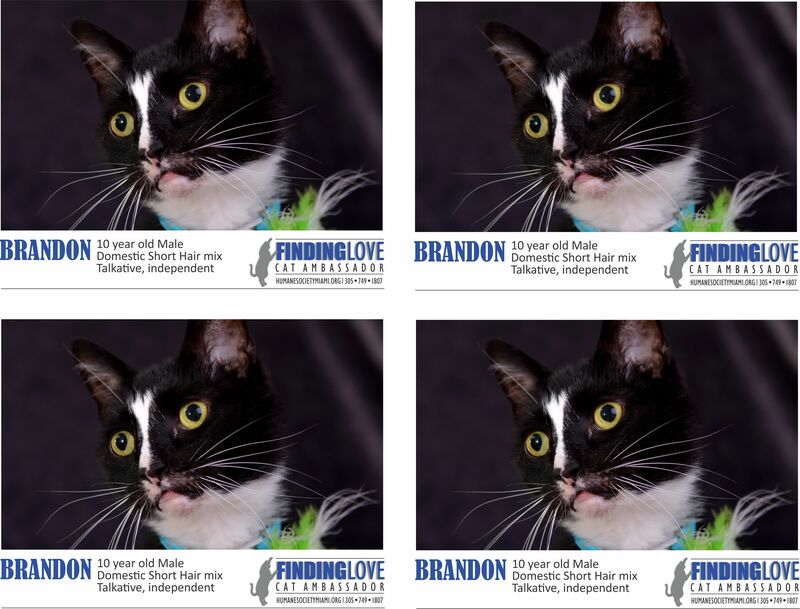 Call 305-749-1807 if you have a question about any of the cats or about the adoption process. Join our team of CAT AMBASSADORS and help us to FIND LOVE for the animals in need! 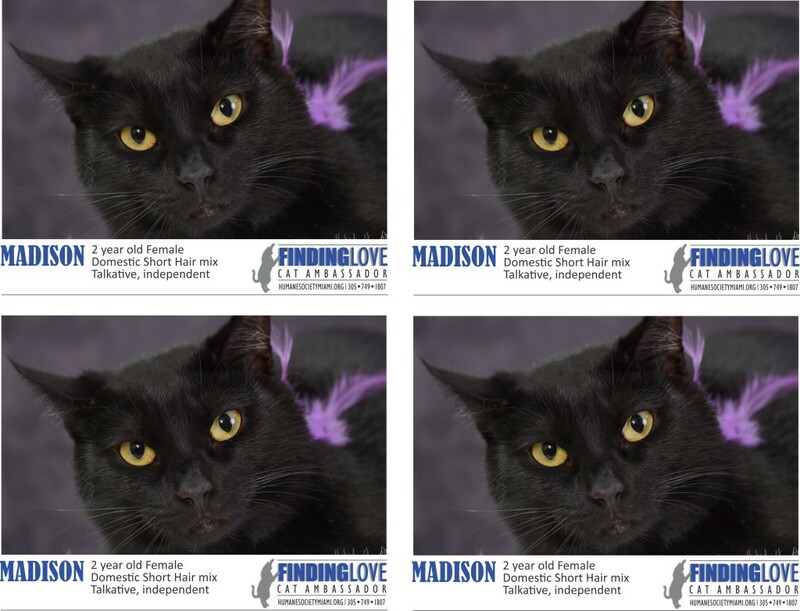 To read happy tails from some of the adoptees of the program, click here! 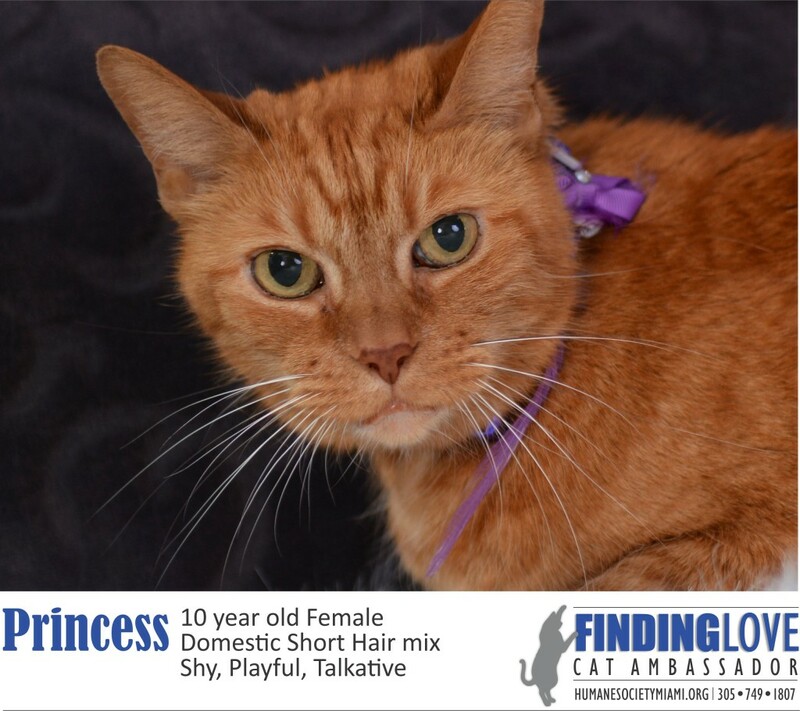 An aged to perfection, talkative, regal cat; Princess will live up to her name. She’s a calm kitty who LOVES to be pet and scratched behind her ears. She’s also very creative and can turn just about anything into a toy! She is declawed, but never the less she enjoys the scratching post regularly as if she wanted to exercise her muscles. Although she might not have a tooth left, she loves to eat anything from can food to yummy treats! 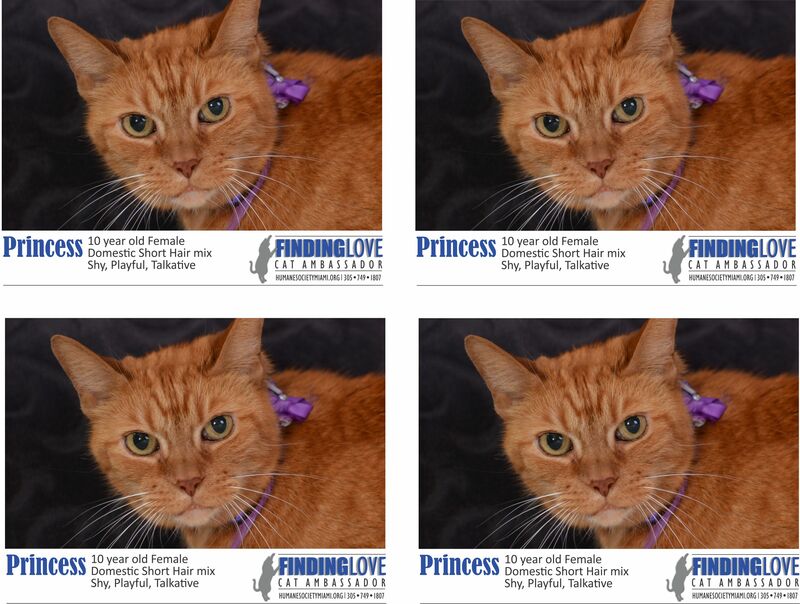 Princess has got a lot of love to give and just needs a special someone to give that love to. 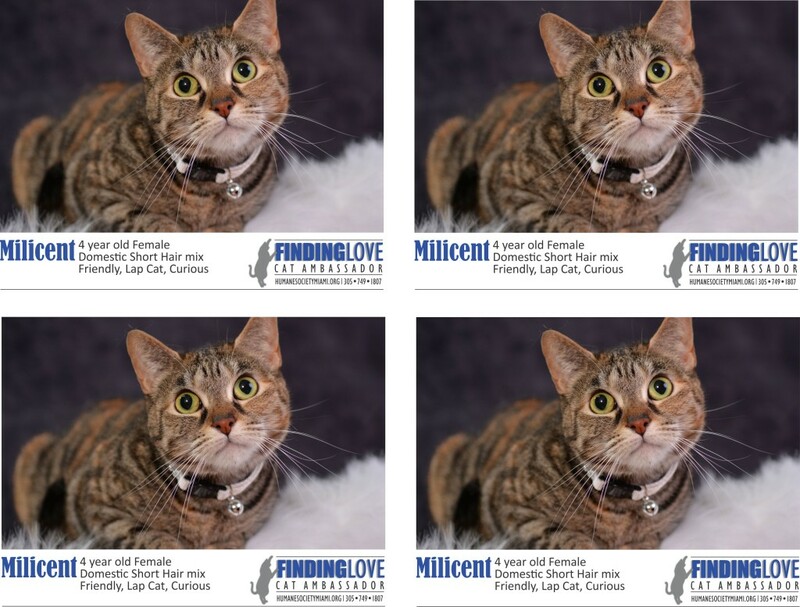 Click here to submit an application to join the Cat Ambassadors and receive flyers and a t-shirt. Picture it: You’ve just wrapped up a long day in the office. After inching home in traffic, you finally pull into the garage. Then your day takes a dramatic turn for the better…you open the door to be greeted with a warm meow from your number one fan, Madison! You spend the evening relaxing together on the couch, purrs of contentment filling the air. Sounds pretty great, doesn’t it? It’s hard to deny that few things can brighten your day quite like cuddling with a soft kitty! Madison certainly wouldn’t argue with that. She doesn’t need any help getting up on your lap either! Being a very independent young lady, she will do it on her own. Extremely affectionate, she loves attention from her older human friends and isn’t afraid to seek it out. When in the mood for a good petting or a belly rub, she will follow your hand around or endearingly roll around to get it. Click here to submit an application to join the Cat Ambassadors and receive flyers and a t-shirt. Beautiful Lucian thinks the concept of personal space is overrated. She’ll crawl right up to your face and pretty much stick her nose in yours to get a good sniff as if that’s perfectly normal and acceptable behavior…she’s a true diva! 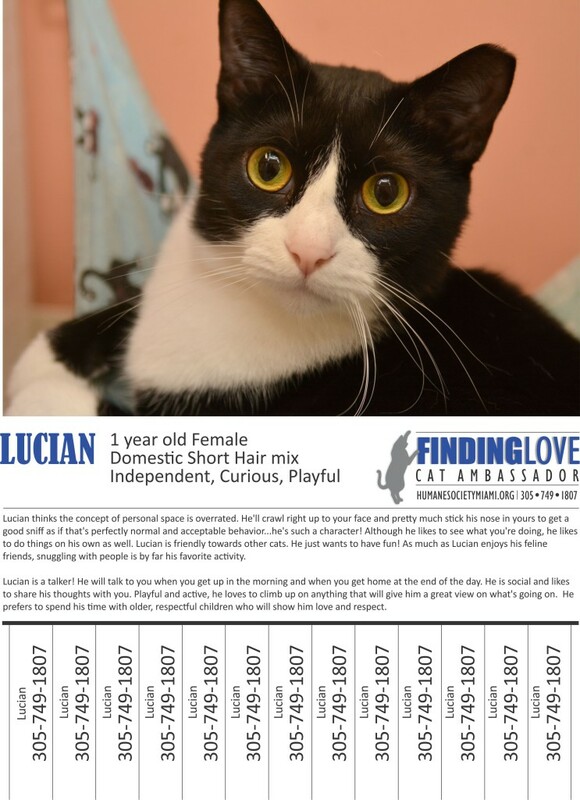 Lucian is also very friendly towards other cats. She just wants to have fun! 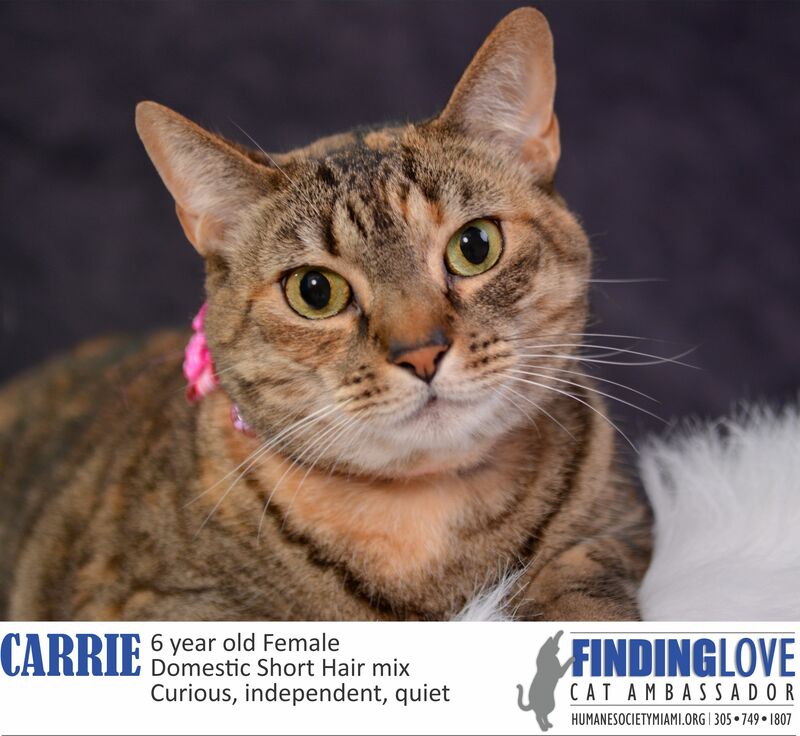 As much as she enjoys her feline friends, snuggling with people is by far her favorite activity. Lucian is a great conversationalist! She will talk to you when you get up in the morning and when you get home at the end of the day. Playful and active, she loves to climb up on anything that will give her a great view of what’s going on. Lucian prefers to spend her time with older children who will show her lots of love and respect. Click here to submit an application to join the Cat Ambassadors and receive flyers and a t-shirt. The saying “Love is blind” just got a new meaning. 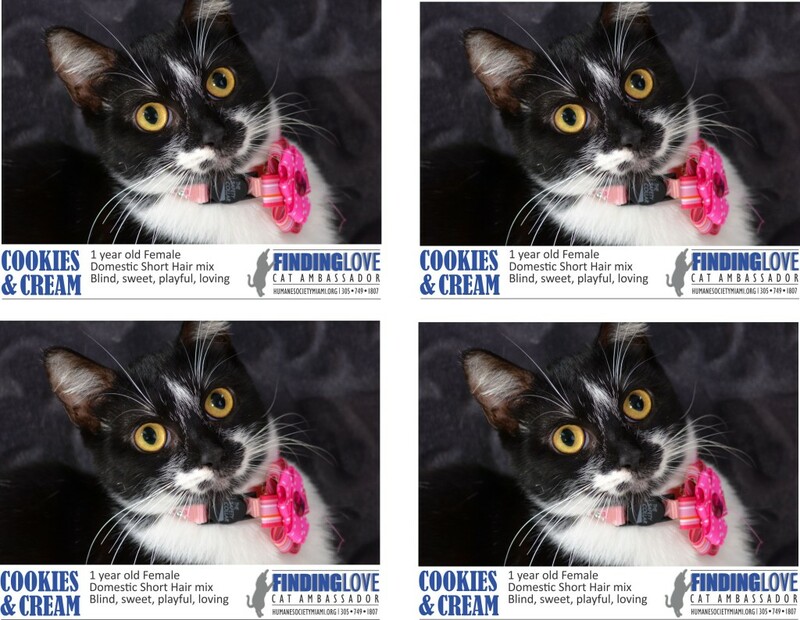 Meet Cookies & Cream, our special needs kitty, who is looking for someone to love. Cookies & Cream came to us to be spayed as a community cat – free roaming cat living on the street. She was very skinny, weighing less than five pounds. Our medical team determined that she was blind and therefore could not provide for herself. Cookies & Cream was in a foster home for a few weeks and adjusted to her new environment and became a confident, affectionate and even playful kitty. She earned her surroundings in the home and acted as she could see. Grooming is easy as she allows herself to be handled. Cat nip and yummy treats are a couple of the things she truly loves. Because of her blindness, you have to approach her with a bit of noise so that she know you are coming. 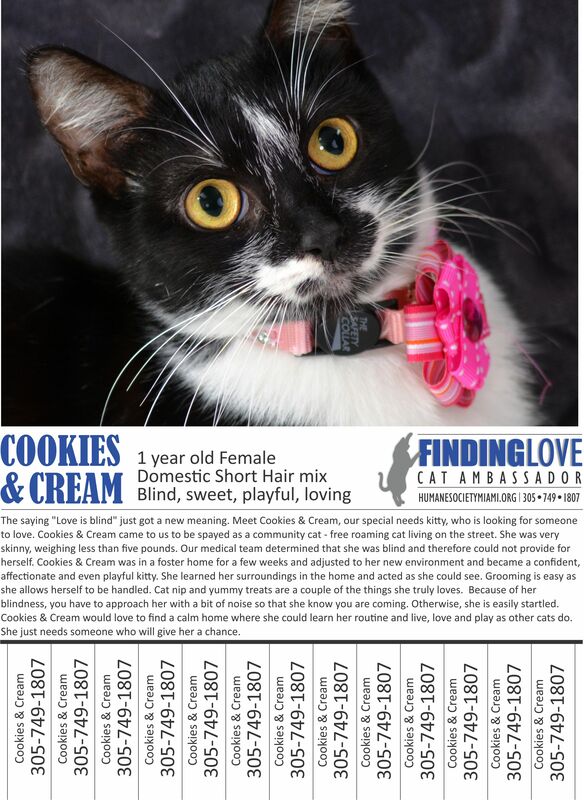 Cookies & Cream would love to find a calm home where she could learn her routine and live, love and play as other cats do. 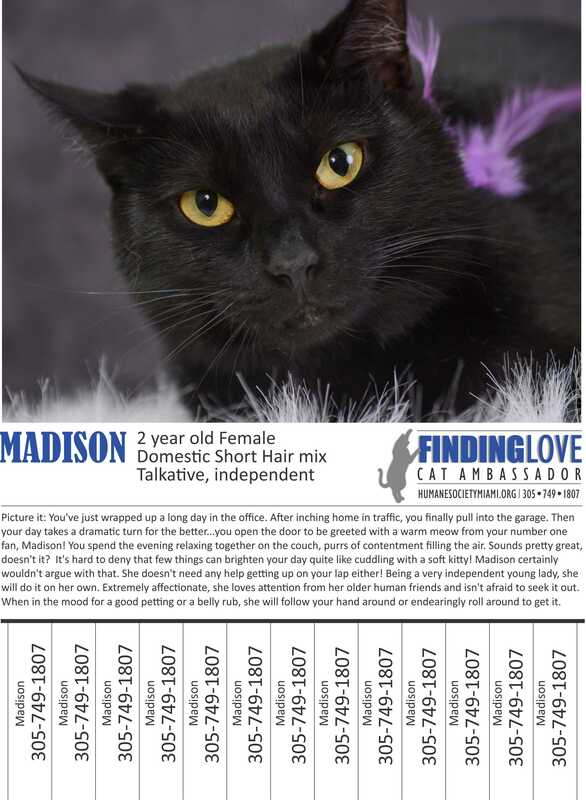 She just needs someone who will give her a chance. Click here to submit an application to join the Cat Ambassadors and receive flyers and a t-shirt. If you need a cat who knows how to stay out of trouble and will always keep your secrets, Brandon is the cat for you! Talkative when he is looking for a treat and always keeping an eye out for fun. Although he is declawed, he still enjoys a good scratching post to exercise his muscles. Once he is comfortable with his surroundings, he will make himself right at home. 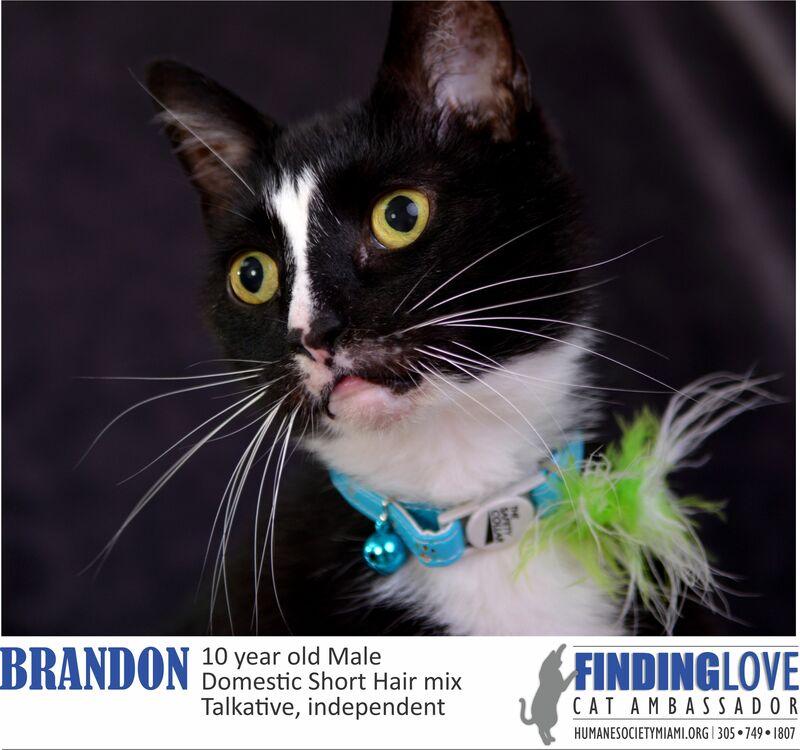 Brandon is comfortable with some cats, but being a lady’s man, he prefers the company of female cats. He enjoys quiet days looking out the window or just hanging out, people watching on a high vantage point. 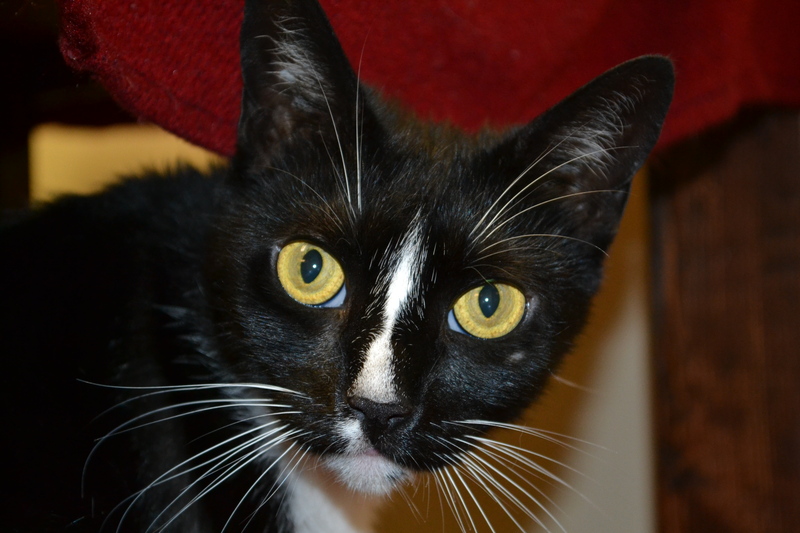 Being 10, he is only middle aged and he is full of life and ready to make funny, wonderful memories with his new family. Click here to submit an application to join the Cat Ambassadors and receive flyers and a t-shirt. Midnight is the purrrrfect blend of sugar and spice. She loves her special humans oh-so-much, and is never happier than when she can curl up next to you purring like a little motor boat. She will sleep in bed with you, and will even hang out in the kitchen while you cook — anything to be near you! 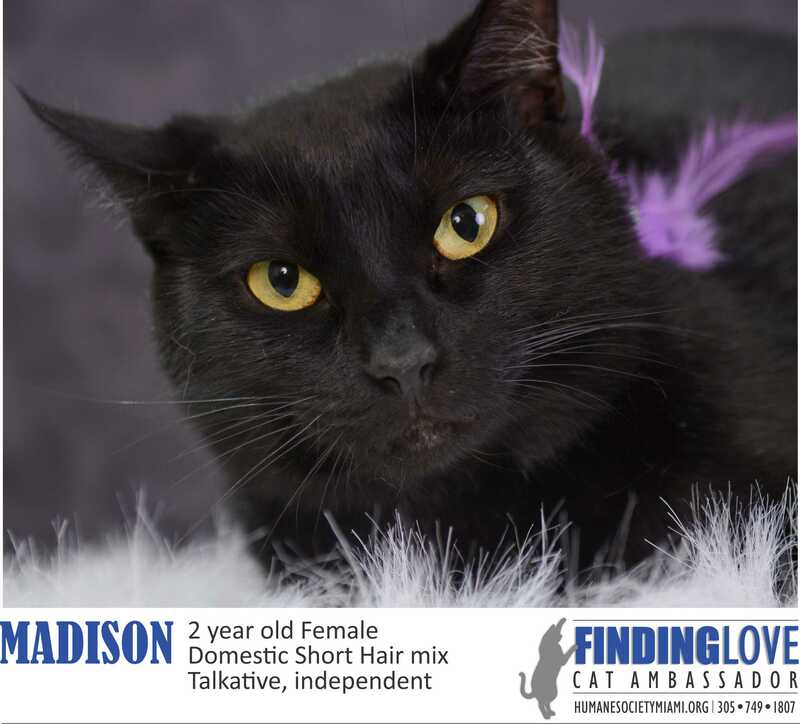 Midnight is an articulate lady who will greet you with cute noises when you come home, and isn’t shy about letting you know when her water or food dish is empty. Although Midnight prefers cuddling to just about anything, she is still very much an independent kitty. She loves dangly toys, balls with bells, scratching pads, boxes to sit in — she loves them all! Midnight likes to be the only kitty in the home and prefers the company of adults. Midnight is a kitty of simple wants. She just needs a little patch in a sunbeam to sleep in, and a window to watch the world outside while she is safe and loved inside. 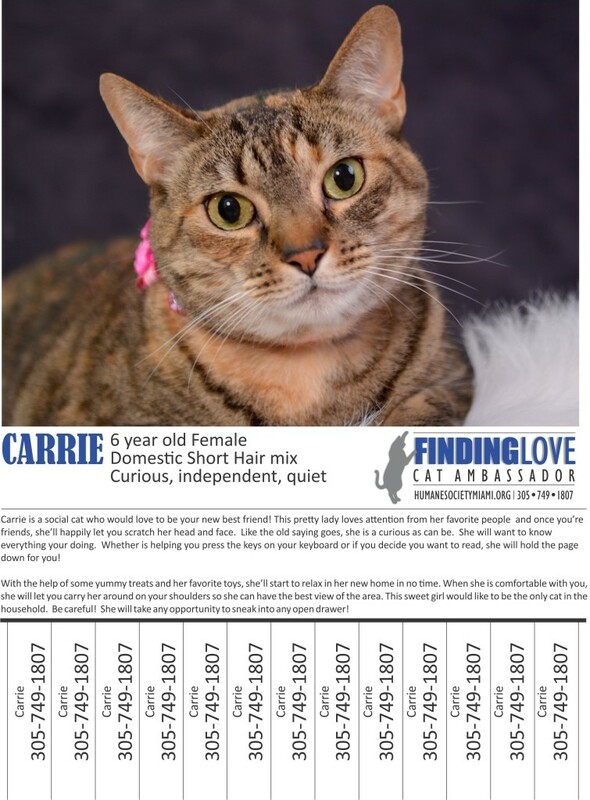 Can you give her the home she needs? In return, you’ll get a loyal companion for the years to come. Carrie is a social cat who would love to be your new best friend! This pretty lady loves attention from her favorite people and once you’re friends, she’ll happily let you scratch her head and face. Like the old saying goes, she is a curious as can be. She will want to know everything your doing. Whether is helping you press the keys on your keyboard or if you decide you want to read, she will hold the page down for you! 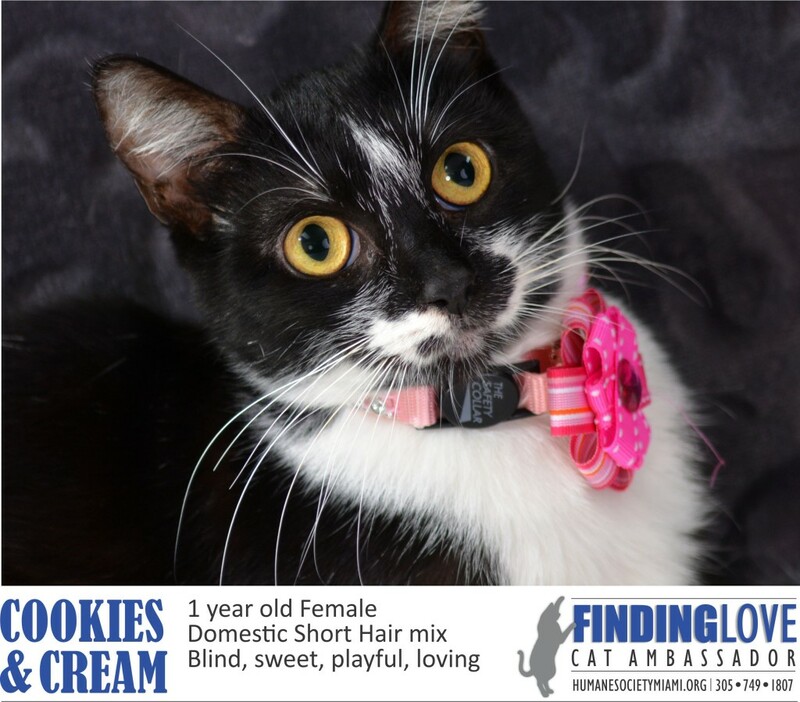 With the help of some yummy treats and her favorite toys, she’ll start to relax in her new home in no time. When she is comfortable with you, she will let you carry her around on your shoulders so she can have the best view of the area. 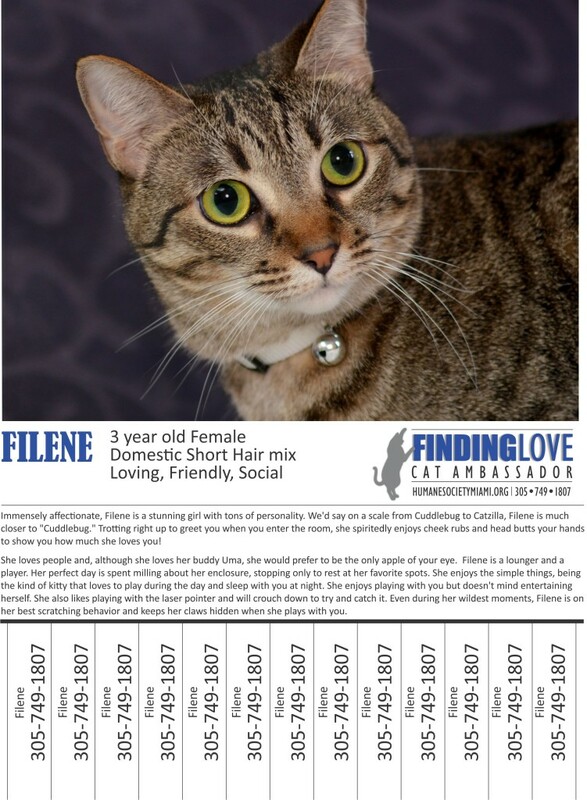 This sweet girl would like to be the only cat in the household. Be careful! She will take any opportunity to sneak into any open drawer! Click here to submit an application to join the Cat Ambassadors and receive flyers and a t-shirt. 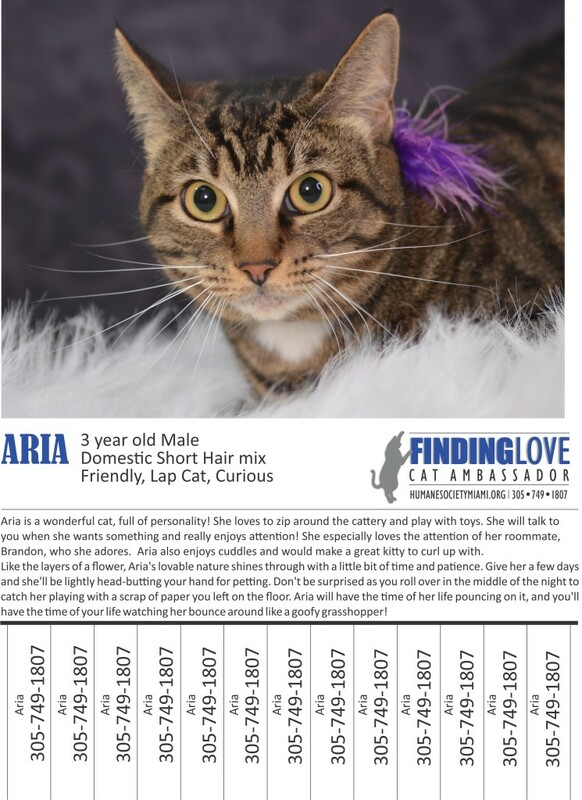 Aria is a wonderful cat, full of personality! She loves to zip around the cattery and play with toys. She will talk to you when she wants something and really enjoys attention! 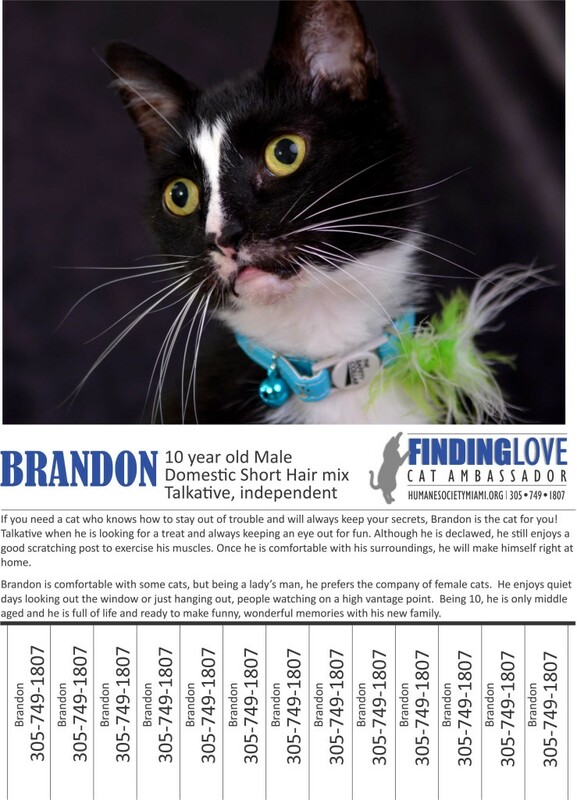 She especially loves the attention of her roommate, Brandon, who she adores. 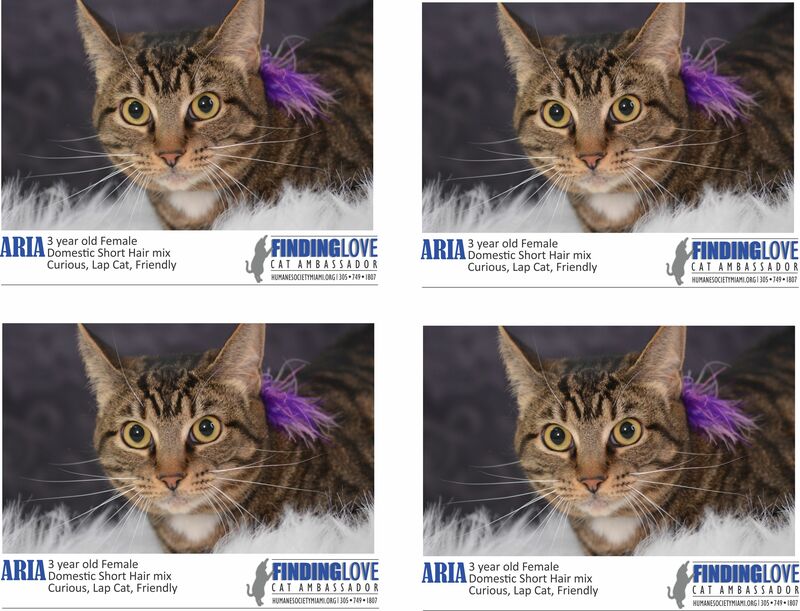 Aria also enjoys cuddles and would make a great kitty to curl up with. Like the layers of a flower, Aria’s lovable nature shines through with a little bit of time and patience. Give her a few days and she’ll be lightly head-butting your hand for petting. Don’t be surprised as you roll over in the middle of the night to catch her playing with a scrap of paper you left on the floor. 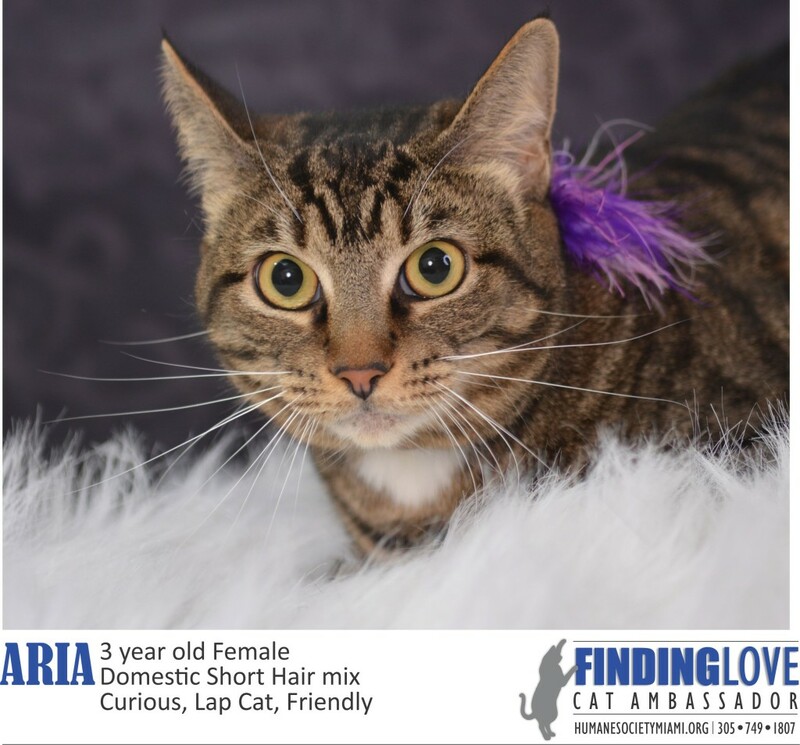 Aria will have the time of her life pouncing on it, and you’ll have the time of your life watching her bounce around like a goofy grasshopper! Click here to submit an application to join the Cat Ambassadors and receive flyers and a t-shirt. 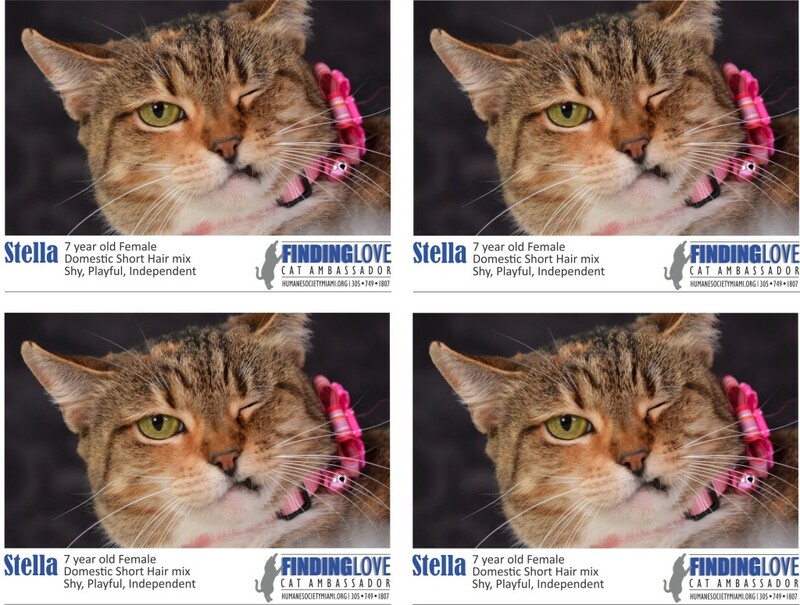 Don’t let her age fool you, Stella is definitely young at heart! 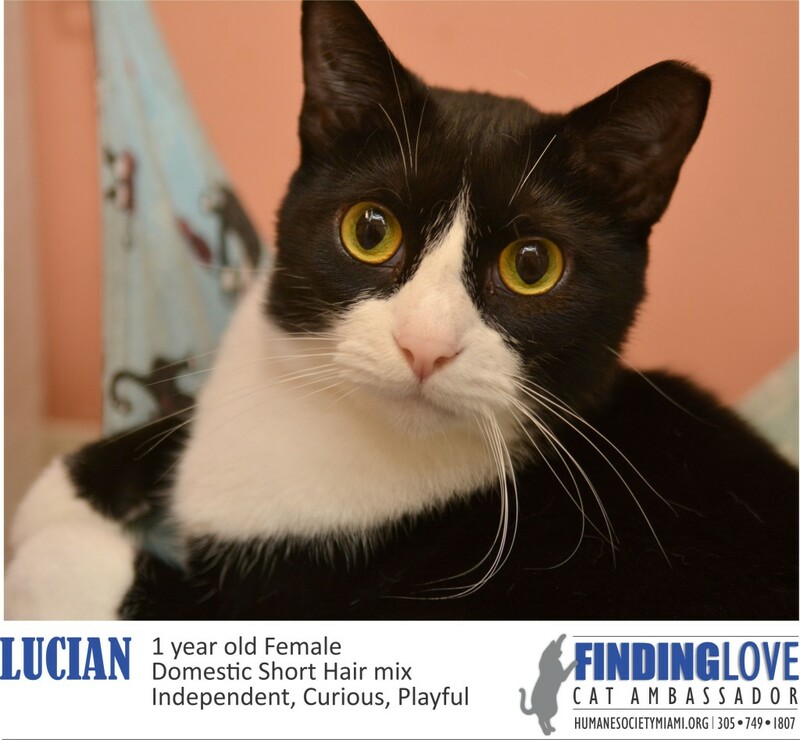 She is a friendly, outgoing girl who loves attention and shoulder massages. 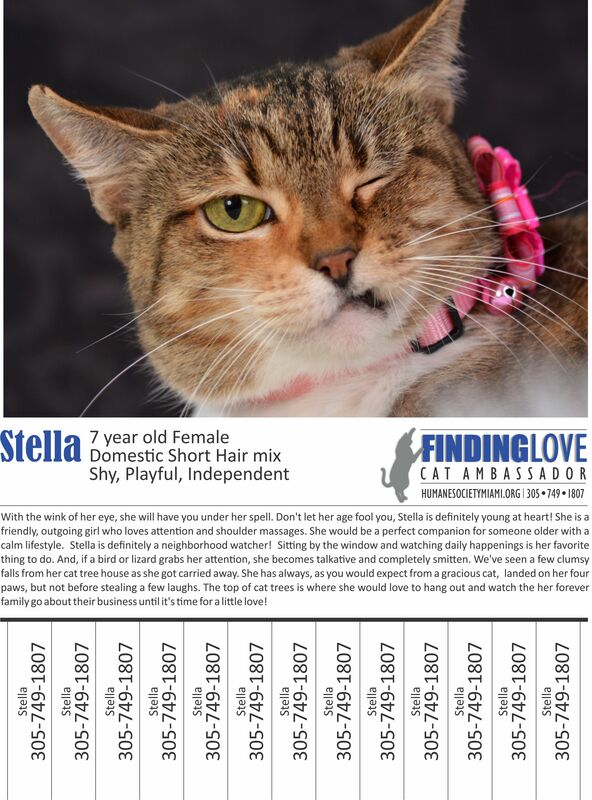 She would be a perfect companion for someone older with a calm lifestyle. Stella is definitely a neighborhood watcher! Sitting by the window and watching daily happenings is her favorite thing to do. And, if a bird or lizard grabs her attention, she becomes talkative and completely smitten. We’ve seen a few clumsy falls from her cat tree house as she got carried away. She has always, as you would expect from a gracious cat, landed on her four paws, but not before stealing a few laughs. The top of cat trees is where she would love to hang out and watch the her forever family go about their business until it’s time for a little love! Click here to submit an application to join the Cat Ambassadors and receive flyers and a t-shirt. A true connoisseur of canned cat food, Uma will come from any corner of the house when she hears the opening of a can! Besides her love of a fine can of cat food, she loves looking good. Uma absolutely loves to be brushed and pampered. She will let you brush her as long as you’re willing to. Uma shares a roomwith her best friend Filene and their favorite thing to do is wrestling around and being goofy. Uma likes to be particular in choosing other kitties to spend time with, however, by introducing them slowly, we think that she would enjoy to have a kitty sibling in her forever home. 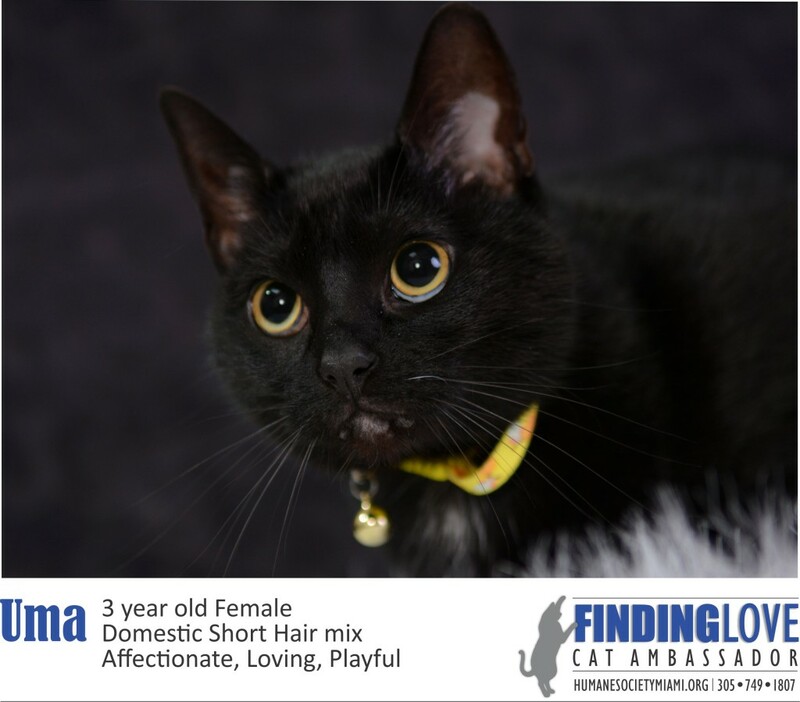 Although she is a little wrestling champion with her furry best friend, Uma would prefer a quiet home with older children. Click here to submit an application to join the Cat Ambassadors and receive flyers and a t-shirt. Immensely affectionate, Filene is a stunning girl with tons of personality. We’d say on a scale from Cuddlebug to Catzilla, Filene is much closer to “Cuddlebug.” Trotting right up to greet you when you enter the room, she spiritedly enjoys cheek rubs and head butts your hands to show you how much she loves you! 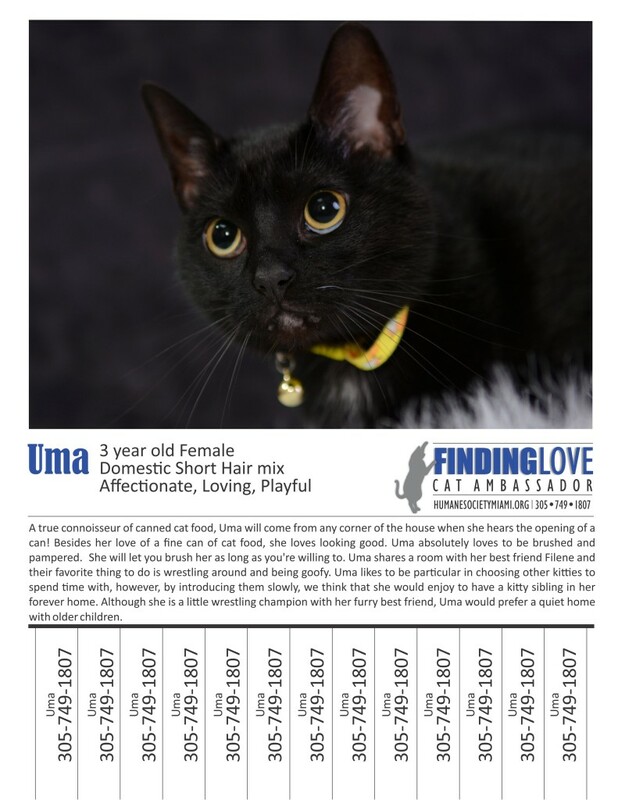 She loves people and, although she loves her buddy Uma, she would prefer to be the only apple of your eye. 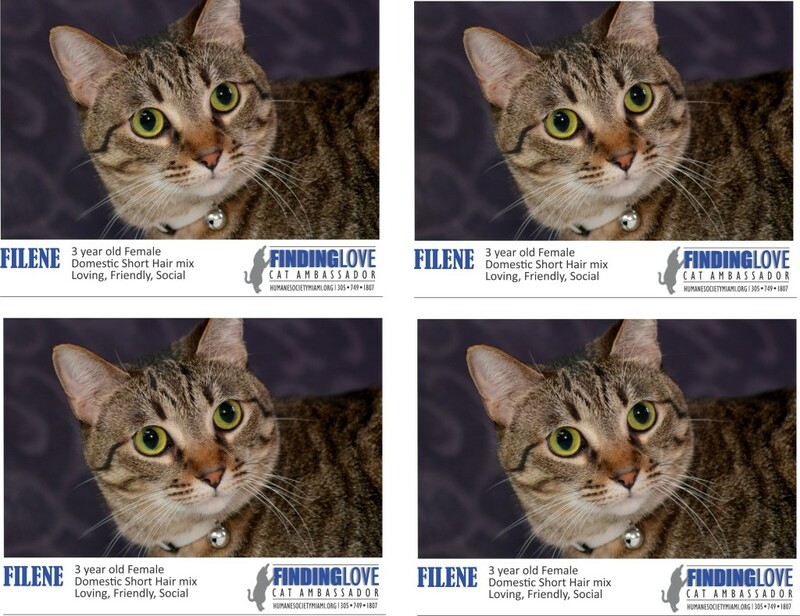 Filene is a lounger and a player. Her perfect day is spent milling about her enclosure, stopping only to rest at her favorite spots. 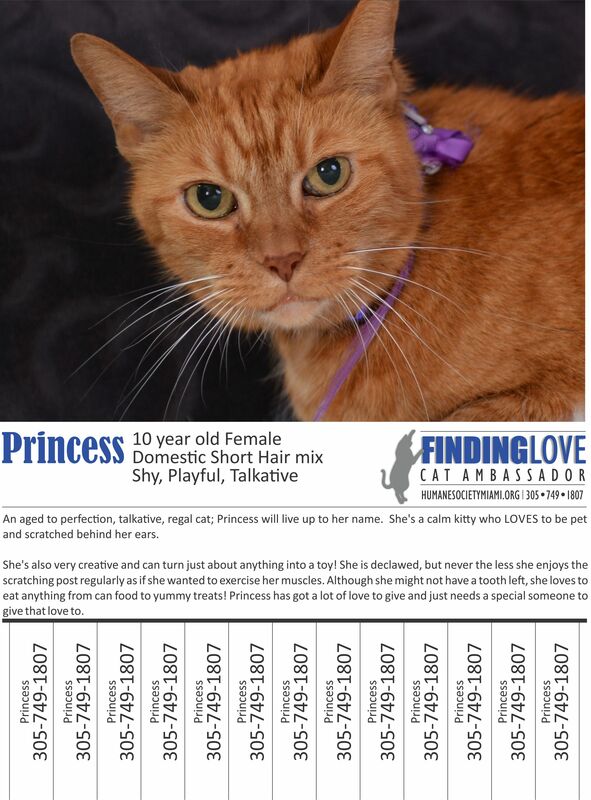 She enjoys the simple things, being the kind of kitty that loves to play during the day and sleep with you at night. She enjoys playing with you but doesn’t mind entertaining herself. She also likes playing with the laser pointer and will crouch down to try and catch it. 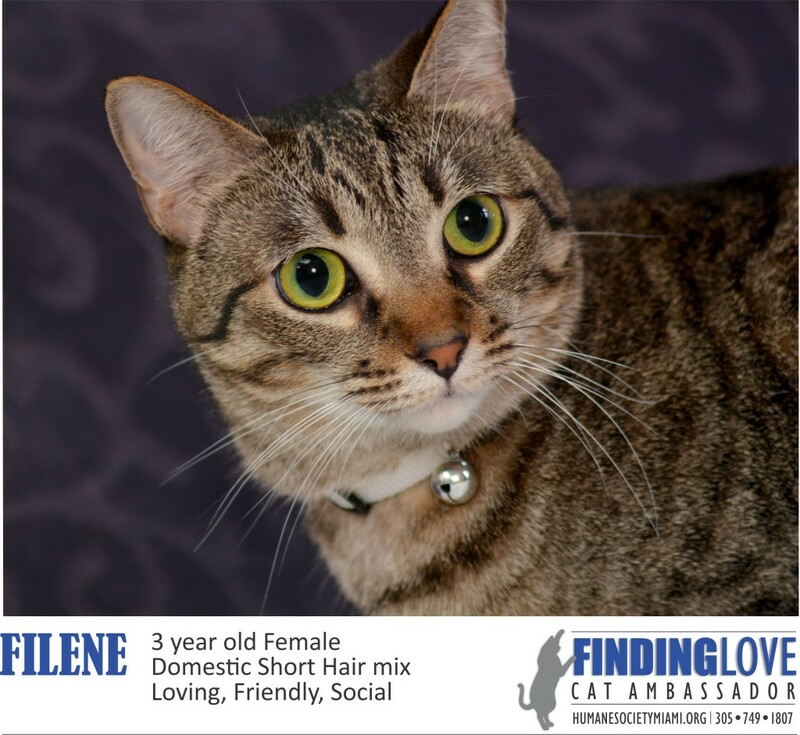 Even during her wildest moments, Filene is on her best scratching behavior and keeps her claws hidden when she plays with you. Click here to submit an application to join the Cat Ambassadors and receive flyers and a t-shirt. 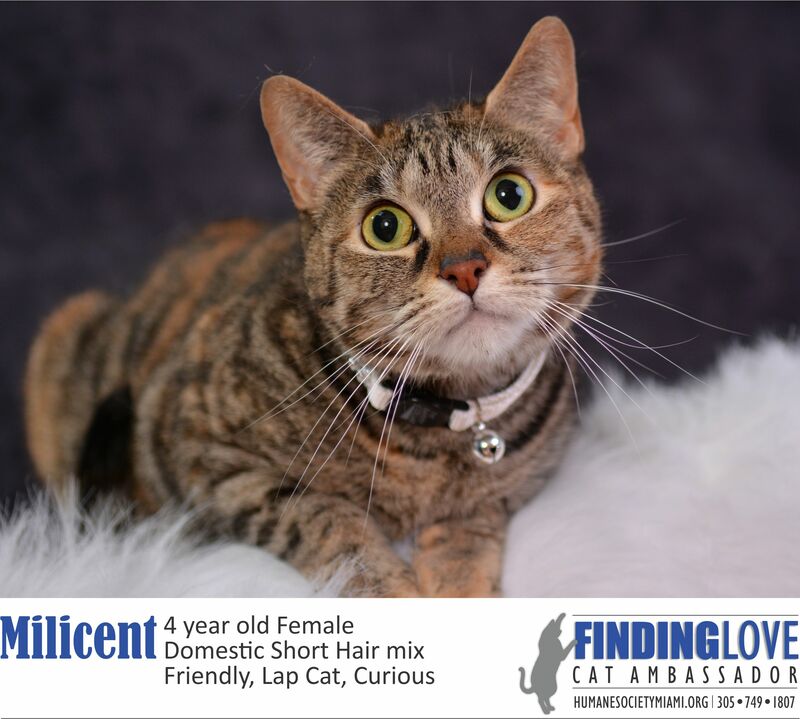 Milicent is a super sweet and playful little gal who would love a variety of toys to play with. Any kind at all will spark her attention! Watching her reaction to cat nip is always a treat! 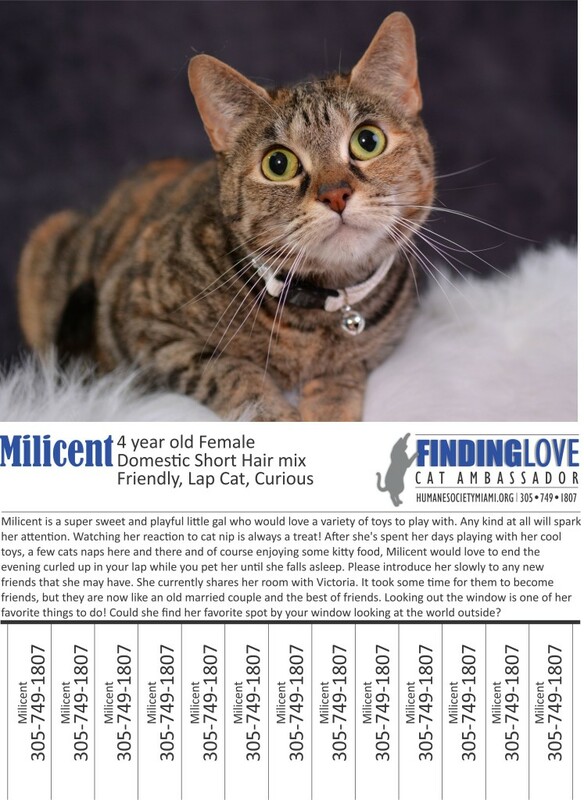 After she’s spent her days playing with her cool toys, a few cats naps here and there and, of course, enjoying some kitty food, Milicent would love to end the evening curled up in your lap while you pet her until she falls asleep. Please introduce her slowly to any new friends that she may have. She currently shares her room with Victoria. It took some time for them to become friends, but they are now like an old married couple and the best of friends. Looking out the window is one of her favorite things to do! Could she find her favorite spot by your window looking at the world outside? Click here to submit an application to join the Cat Ambassadors and receive flyers and a t-shirt. Did you leave a bag on the floor? Well, before you know it, it will be filled with our beautiful Victoria. No need to buy expensive toys or a play station, just throw a couple of bags around and she will have a field day. Add a catnip toy, and watch her playful antics beggin! 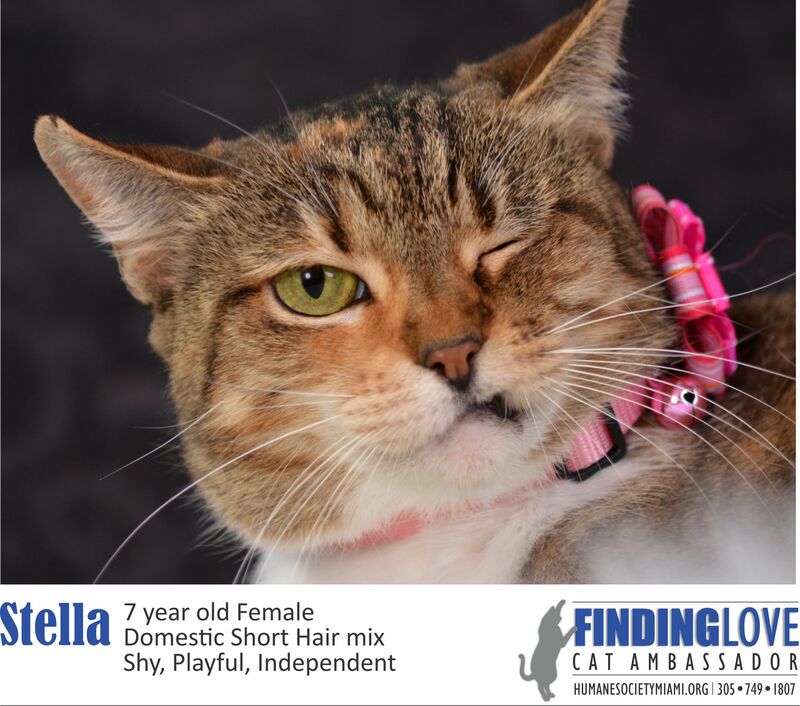 Although she is very playful, she prefers to be the only apple of your eye. And when she’s not playing, Victoria just enjoys watching you as you go about your day. Often enough, as she gets tired, she’ll come looking for your lap and fall asleep. 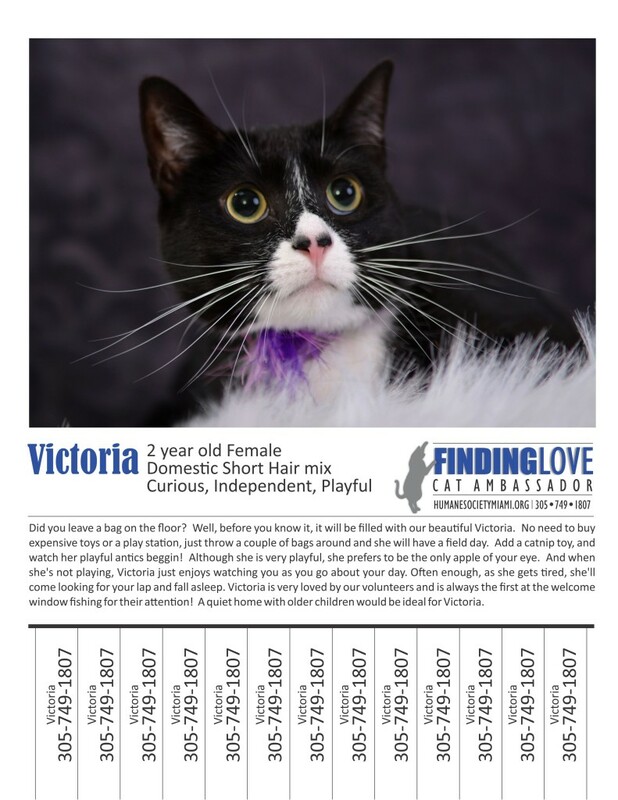 Victoria is very loved by our volunteers and is always the first at the welcome window fishing for their attention! 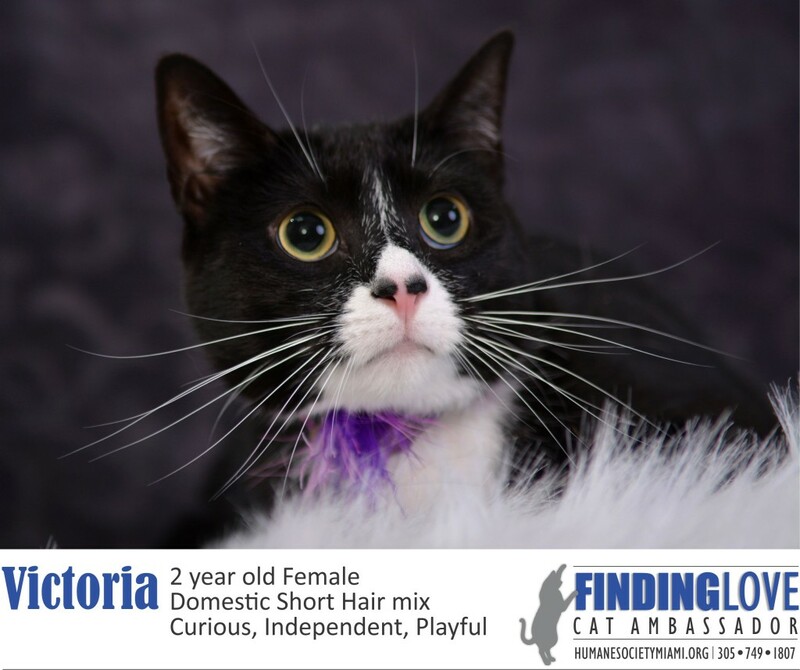 A quiet home with older children would be ideal for Victoria. 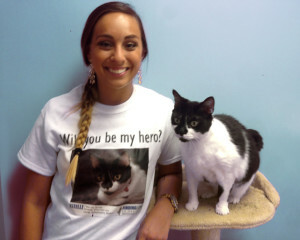 Click here to submit an application to join the Cat Ambassadors and receive flyers and a t-shirt.